Seeing the Ring Cycle is an important experience in a lifetime of cultural appreciation. I saw it first in 1975, at the time not knowing much of anything about Richard Wagner, its composer, except that opera lovers tended to fall into two categories: those who loved Wagner, and those who hated him. It seemed there was no middle ground. I also knew virtually nothing about the Ring Cycle before attending for the first time, but I had read an illustrated children’s version in My Book House, an anthology I pored over as a child. I was raised on tales of Robin Hood and Maid Marian, the Song of Roland, and the Knights of the Round Table, not to mention all the stories of the Greek and Roman gods. 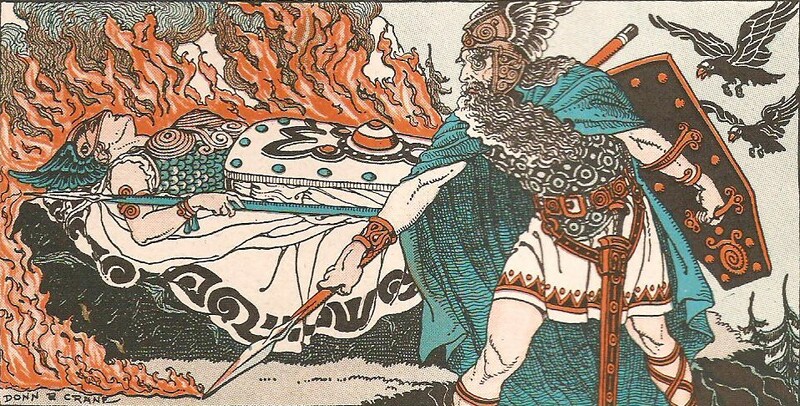 Wagner’s Norse gods were familiar from these same sources. What was not familiar was his approach to opera, which he called music drama. The music flows in a very different manner from the way it does in Italian opera with its lively tunes and frequent pauses. Or even Russian opera, which in its great exemplar, Boris Godunov, also has discernible songs. Wagner was different. At the Ring, I expected to see large middle-aged people sing, and they did, but I was very disappointed because none of them wore any armor. There were no winged helmets on the Valkyries, either, and the minimalist sets seemed lit by a mere 40-watt incandescent bulb. 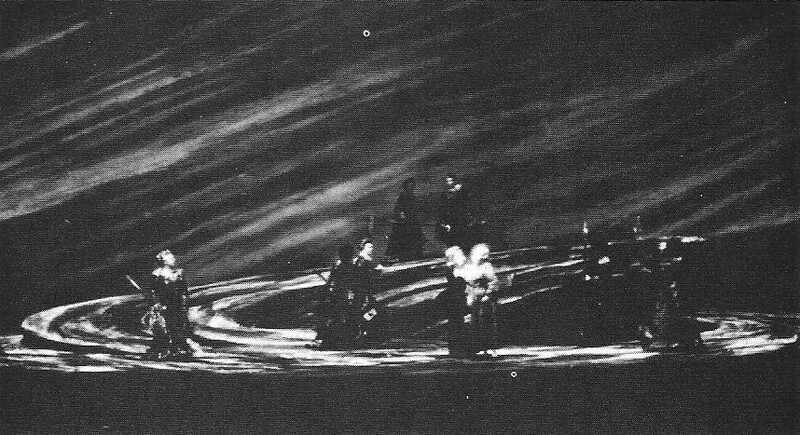 That production featured a stage set that was a a mere raised, raked circle of wood, upon which much of the action took place. Very dull visually. Meanwhile, the music never stopped. There was no applause during acts to clue me that I had just seen something important. I was at a loss, both visually and musically. I have always been very visually oriented. When I graduated from children’s books to more adult reading, I lost the pictures and I missed them. I found them again in comic books. Text alone is not inherently more adult than text with pictures, but I grew up during the height of “modern art,” a nonrepresentational period. Printing costs for illustrations were high, and almost no books for adults had interior illustrations anymore. There weren’t even any frontispieces, as had also been the style in years past. At that time, representational commercial art was still practiced by highly skilled artists, but was being slowly replaced by cheap (and initially, cheap-looking) photographic printing in newspapers and magazines. But not in books. The only print medium with representational art as story (outside of children’s books) was comic books. It was a revelation when I finally discovered the pre-Raphaelites and their beautiful paintings, which now are considered serious high art but certainly were close to their nadir of perceived merit then. The pre-Raphaelists often illustrated classic romantic stories such as the Arthurian legends. Tales of chivalry appealed to me throughout childhood. As a teenager, comic books took over as a source for both noble adventures and color. Later, as an adult, operas were the next colorful progression for me, since they contained in their music and in their drama all the elements of chivalry, adventure, and visuals that I’d liked in other media. Plus there was music I did not understand but liked. I don’t remember anything else about seeing those four operas in 1975, other than the medieval-style robes the singers wore, and the boring set. Before the advent of surtitles, connecting with the drama intimately was difficult as an act dragged on and no immediate translation was available. My college German had not been extensive enough to provide me with enough vocabulary to guess at meanings, and Wagner operas tend to be talky. Undoubtedly, I dozed off here and there. I was seeing these after a full day at work; a dark theater is a lovely place to nap. Considering that first experience, it’s amazing that I continued on and saw all the other major Wagner operas: Tannhauser, Die Meistersinger, Tristan & Isolde, Lohengrin, and Parsifal. Despite my disappointment with my first Ring Cycle, eventually I saw all parts of the Ring Cycle again, piecemeal. In this century alone I’ve seen Das Rheingold three times, and Die Walkure four. Some were live, some were in movie houses, and some were on television. I saw an amazing Rheingold from Barcelona with the gods in cherry pickers pushed around on stage. There was an interesting Rheingold from La Scala with the Rhine maidens bathing in actual water, and various projections running as backdrops. I saw a modern techno Die Walkure from the Washington National opera at Constitution Hall, and then only a couple years later, one set in America in the 1930s from the same company at the Kennedy Center. There was also a Walkure from La Scala in which the Valkyries dressed for battle in ballgowns. (Okay, it’s Italy, a fashion center, but those skirts were preposterous.) And of course I went to the HD showings of the Met’s recent versions of Das Rheingold and Die Walkure, whose enormous, stage-center machine is so distracting that it’s hard to separate out impressions. HD simulcasts tend to blur the audible distinctions between stentorian voices and merely sweet and small ones, and sometimes the camera work detracts from the drama. Still, opera remains an intensely visual medium that features dramatic stories of high adventure and romance. My kind of thing. That’s why I finally took the plunge again after so many years and went to see an entire Ring Cycle at the San Francisco Opera.